This is just a quick post today, since my to-do list has overpowered my intentions. However, I did want to include a reminder that for this Wednesday’s Q&A, I will be featuring poet Penn Kemp. As the writer-in-residence at The University of Western Ontario, Kemp has gone above and beyond in her role, taking poetry and arts advocacy to the community-at-large and engaging diverse audiences with her philosophies and artistic practices. Please join me on Wednesday to learn a bit more about this incredible writer. Since my to-do list is a bit overcrowded today, I am afraid I must keep it short. I hope to resurface soon and share some of my latest reads, readings, and reviews. Have a great Cyber Monday! 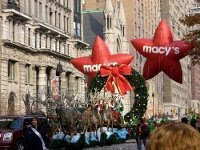 For as long as I can remember, I have always tuned in to the televised Macy’s Thanksgiving Day Parade. So, of course, this year I was anxious and eager to have the celebratory floats in the background while I worked away. This year the celebration meant something different for me; this is my first American Thanksgiving as a resident. I still honor the Canadian date, but it’s nice to have two thankful days to celebrate. Which makes it very interesting… odd… quirky… that I. Somehow. Completely. Forgot. No, I didn’t forget Thanksgiving. I forgot to watch the parade. When I woke up Thursday morning I got straight to work. I proceeded to work the majority of the day (aka: all day, but I hate to sound like a nerd) and it wasn’t until Dear Spouse asked about watching the parade that I realized… I forgot. I was so busy and involved with catching up on work that I actually forgot about the whole parade thing. Of course, in the big scheme of things, this is no big deal. But, it leads me to the topic of what I’m thankful for. As a writer, I want to kick myself every time I complain about being too busy. The fact is, I should be – and am – very grateful for the amount of work I have. If I had no writing work, that would be sad. Right now, my writing life is full and wonderful and consuming and I can’t think of anything to be more thankful for. I’m working, I’m writing, I’m happy. So, despite missing my ‘first’ parade, I can still walk away from this year’s Thanksgiving knowing I celebrated in my own poetic way. Yes, I made an overwhelming dinner and, yes, we enjoyed the evening. But the day was spent honoring the work that makes me happy. For this, I am truly thankful. I recently came into acquaintance with Dawn Potter, author of Boy Land and Other Poems and the newly released Tracing Paradise: Two Years in Harmony with John Milton. Tracing Paradise is an incredible memoir on writing from a poet whose work has been called “fearless” by Ellen Dudley. Her next poetry book, How the Crimes Happened (CavanKerry Press), will be released in March 2010. Please join me in welcoming Dawn Potter. Hi Dawn. Can you tell us about what prompted you to write Tracing Paradise? Actually, I had no intention of writing this book. I had come to think of myself as primarily a poet, and writing a memoir had never occurred to me. But I had undertaken the weird task of copying out all of John Milton's Paradise Lost word for word, and the poem was going to my head. I was literally driving past exits because I was too busy thinking about Milton. And finally, after I'd spent yet another hour at my friend Baron Wormser's kitchen table gabbling away about what I was learning, he told me to write a book about it, promising to read the first draft of every chapter if that would help me to get my thoughts onto the page. His offer was a tremendous gift because not only did I immediately have an audience, but also Baron (who is himself a poet and essayist) is a great teacher and so was able to pinpoint gaps and ask questions at a very early stage of the project. As readers, we can't be expected to enjoy everything. Why did you feel it was important to study - so intensely - a poem you never liked? I should say, first, that I am not a literary scholar but a common reader in Virginia Woolf's sense of the term. She said, "The common reader . . . differs from the critic and the scholar. He is worse educated, and . . . reads for his own pleasure rather than to impart knowledge or correct the opinions of others. Above all, he is guided by an instinct to create for himself, out of whatever odds and ends he can come by, some kind of whole." In my case, while I am devoted to the western literary canon, I'm also largely self-taught and haphazard and subjective: "rickety and ramshackle," as VW says. Paradise Lost was sitting up there on the Great Books shelf, and yet I had never liked it or had any sympathy it. So I thought it was about time to try. I had just finished putting together my second poetry collection; I was at loose ends about my next project. And often, when I'm not actively doing my own writing, I'll turn to copying. I think that copying out a poem or a bit of prose is the closest way I have to getting into an author's head: it forces me to deal with every comma, every strange capital letter and line break. And often copying jump-starts me into my own writing. My friend Will refers to it as my "gateway drug." But honestly, I thought I'd copy out a page of Paradise Lost. I never, ever, imagined I'd copy out the whole damn thing. Yet I did, and it changed my life as both a writer and a reader. What did you discover about Milton's work that impressed you? This is exactly the question that Tracing Paradise tries to answer. I found a bewildering number of intersections between Paradise Lost and my own twenty-first-century life in rural Maine. It seemed, after a while, that everything I did, from stacking firewood to cooking a chicken, had some relation to the poem. But if I had to choose just one vital discovery, I would have to say "his sentences." They are unbelievably rich, and not merely in their beauties of sound and diction and image and syntax. What I discovered, as I copied out the poem, is that I could actively feel him working his way into his own thoughts. I realized that, very often, he didn't know what he was going to say until he started to say it: creating the sentence was the exercise of discovery. Somehow that made him so much more human to me. He wasn't just a marble bust on a shelf but a curious, grumpy, idealistic, infatuated, joyous, confused man who had once sat in a chair with his chin in his hands and tried to figure out how an angel's digestive system might work. While going through this exercise, what did you discover about yourself as a writer? Humility. Milton took risks that I certainly will never equal and that I think no artist may ever equal again, simply because our relationship to faith and dogma and culpability has changed so radically in the four hundred years since his death. As I say in chapter 2, he literally "laid his eternal soul on the gridiron to invent [Satan,] one of the rare literary characters who will survive in our tradition until the planet explodes. . . . And for so doing, Milton may indeed be weltering in the very hellfire he imagined, paying eternally for his hubris." That kind of risk is almost incomprehensible to us today. But this isn't to say that he doesn't also give me optimism, as I try to explain in my book's afterword: "Experiencing the poem, following its every step down every page, has given me such hope for my own work. It has shown me that the nobility of poetry lies in its artisan commitment to language as a venture into wonder. Poets think their way into mystery: deli beration builds on accident; accident builds on deliberation. . . . In Paradise Lost, Milton writes his vision of the cosmos. But he also invites me to write my own." Would you share a little of your next book of poems, How the Crimes Happened? 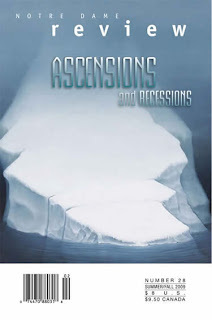 CavanKerry Press is releasing the poetry collection in March 2010, which is very exciting for me. It's almost unbelievable to think that I'll have two new books out within the space of a year. Maybe the best way to introduce it here is to give you a poem. This one is titled "Eclogue," which is an ancient style of pastoral poetry. Virgil, for instance, wrote a book of eclogues before he wrote the Aeneid. who happened to be me. like children, our bodies betray a fatal longing. till labor shakes us back into our yoke. this side of lovely, like flowers under glass. blat irritably. In the yard our sons quarrel. Mourning doves groan in the eaves. and carry her back home, then squat to mend the ragged fence. cooling on the counter. I’ve been saving it for you. Can you tell us about Frost Place Conference on Poetry and Teaching? The Frost Place Conference on Poetry and Teaching is a week-long summer seminar for language-arts teachers working at all levels, elementary school through college, who are committed to making poetry a central element of their curriculum. These teachers spend a week together in Robert Frost's barn in Franconia, New Hampshire, where they study and talk with eminent poets who are also top- level teachers in their own right. It really is a life-changing experience for many of the participants, who may not otherwise have colleagues who share their conviction that poetry is a vital emotional and intellectual element of education. Anybody looking for details about the 2010 conference should check out the Frost Place website: http://frostplace.org/. Where can readers learn more about your and your writing? I have a blog, http://dlpotter.blogspot.com/, that I update almost every day and that also has links to books, interviews, etc. Join me next week Wednesday for my Q&A with poet Penn Kemp, writer-in-residence at The University of Western Ontario. What a great weekend of poetry and people. Friday’s reading at The Lawrence Street Gallery was a great night with a lovely and supportive crowd. It was a pleasure to share the stage with Zinka Joseph. She read from her beautiful chapbook of poems, Lands I Live In (Mayapple Press), and wowed the audience with such a beautiful voice and a lovely charm. It was a pleasure to meet Zilka and share an evening of poetic voices with her. Saturday’s launch of Renaissance City was incredible. Hosted by John Jeffire at Maxwell’s in Garden City, this event rocked the house. A full bill of poetry and music carried on for five hours! This was my first time at Maxwell’s and what a sight. It’s an art fair/ antique bizarre/ performance venue wrapped into one cool warehouse that was warmed with wine and friendship. The readings were inspiring, the music eclectic, and the audience was fully engaged. Thank you to John Jeffire and the folks at Maxwell’s for throwing a great party (and to poet Ken Meisel for the red wine!). After such a great weekend of hearing poetry, I was inspired to read some new work and introduce myself to more voices. I simply have to share this as it’s too good of a deal to miss out. Did you know you can get a free issue of Notre Dame Review? If you’ve ever considered subscribing to this wonderful journal, take advantage of this incredible web offer here. I did and can’t wait to start receiving NDR on a regular basis. Not only is it important that we support our literary presses, but what other way can you be introduced to so many great voices all in one sitting? I highly recommend treating yourself to a subscription or two to some of the many great journals out there. I recently subscribed to Poetry. If you haven’t yet, now is the time. I just noticed they have an incredible gift bonus offer. When you buy yourself a subscription to Poetry, you get a gift subscription for free. This is a great idea for the holidays. Support your literary presses and give the gift of poetry this holiday season. 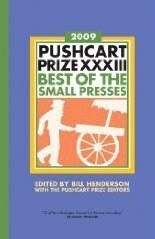 Another splurge this weekend includes ordering a copy of the 2009 Pushcart anthology. I’m looking forward to seeing what the year brought in. I was reminded to do so, as the time has come for the new nominations to make their way to the Pushcart Prize folks. There are always some great new voices featured, so I’m looking forward to what will arrive in the mail in a few short days. This week, be sure to join me on Wednesday for a Q&A with poet Dawn Potter. Her latest book is a surprising take on Milton… and the art of discovery. You’ll have to wait until Wednesday to learn more, but I do hope you’ll come back to find out about her beautiful new book, Tracing Paradise. Thanks for stopping in today. Have a great Thanksgiving week and see you next time. I’ll be joining Zilka Joseph, author of Lands I Live In (Mayapple Press). Plus, there’s an Open Mic for brave, poetic souls. Hosted by Tonja Bagwell. More info and directions to the venue here. This is going to be a great night with eighteen artists and writers performing and sharing work in celebration of the Renaissance City e-zine launch. Join locals John Jeffire, Ken Meisel, Dan Ames, and more for a good night of poetry, jazz, and blues. More info about Renaissance City here. I look forward to seeing some familiar faces at the readings this weekend! Today is a big day for author Melissa Senate. Her latest book, The Secret of Joy, is finally available! I've long been a fan of Melissa's work and am very pleased to share this inspiring interview with you here on the blog. Please join me in welcoming Melissa Senate! Hi Melissa. Can you tell us about The Secret of Joy? 28-year-old New Yorker Rebecca Strand is shocked to discover, via her father’s deathbed confession, that she has a 26-year old half-sister he turned his back on at birth. Determined to make up for her father’s actions, Rebecca takes the cache of letters he wrote every year on her birthday—but never sent—and knocks on Joy Jayhawk’s door in a small Maine town. She doesn’t receive the warmest welcome, but is determined to forge some kind of family relationship. With the help of the Divorced Ladies Club of Wiscasset, a hot carpenter named Theo, and one cute little black dog, Rebecca just may end up unlocking the secret of joy for herself and several other characters. At its core, The Secret of Joy is about what family really means. Let’s say you’ve never met your biological father and then his other daughter, the one who grew up with him, comes knocking on your door saying you’re sisters. Are you? Does sister just mean you share DNA? This is a very personal question for me, and one that I wanted to explore in my fiction to help me figure out my own life. Several years ago, I received an email out of the blue with the subject header: I think you might be my half sister. I was. Am. This raised so many questions for me, and I did what writers do: flipped everything on its head in a fictional scenario and sent my characters off to explore my burning questions. Let’s hear more about your next book, The Mosts. What propelled you to write a novel for teens? The Mosts is about Most Popular, Madeline Echols, whose standing at her high school is suddenly threatened by her best friend, her boyfriend—and a group of “misfits” who hire her to help them make the Not List. Just as there’s a “Most Popular” and a “Most Hot” at their school, there’s a “Least Popular” and a “Least Hot.” And the Meanies make that underground list. Madeline’s entire life, entire perspective, changes when a “Not” asks her help in keeping off that list. My teen years were such a time of confusion and angst (yeah, I know it’s like that for everyone!) that I wanted to write a novel about the struggle for identity, finding out who you are, what you think, what you want. I also wanted to explore what it’s like to be on both sides: are the glittering, popular girls really leading such charmed lives, or does it just appear that way? Are the supposed misfits really misfits? Or are they just happily themselves and others can’t deal with their lack of conformity? The Mosts will be published June 2010 by Random House’s Delacorte imprint. What are some of your favorite YA titles? Anything by Susan Juby, Carolyn Mackler, Melissa Kantor, and the wonderful Meg Cabot. I’ve also been re-reading some gems that I loved from my generation, like Paula Danziger’s The Cat Ate My Gymsuit. You’re very prolific. Tell us about your current work-in-progress. I’m staring down a January 1st deadline for my next women’s fiction novel for Simon & Schuster. It’s tentatively titled The Love Goddess’s Cooking School and is about five people taking an Italian cooking course. It involves delicious Italian cooking, the teensiest bit of magic, a little romance, and the exploration of many types of relationships (my favorite subject). What sort of research have you been eating? Oops, I mean discovering! One talent I wished I had (aside from being able to sing and play an instrument) is to cook. I stink. Everything I make comes out either awful or passable. So I just don’t cook and I feel bad about it. The protagonist of the novel I’m writing now is leading an Italian cooking course, but she can’t cook either (and luckily for her, her students, like her, are seeking something other than making a good risotto). She discovers there’s a secret to cooking and it turns her into a pretty good cook. I tried out my secret-theory on many recipes for Italian dishes—involving lots of cheese, lots of cream sauces, and lots of stuffed pasta, and of course, tiramisu. I didn’t mean to become a writer. In the year 2000, I was a fiction editor on my way to graduate school to study urban education and teach English in the New York City public school system. The summer before school started, I received a call from a former colleague who told me about a new imprint Harlequin was creating for chick lit books, and since I was a walking, breathing chick lit cliché (editor, serial dater, life contemplator), if I wanted to work on a proposal, she’d love to see it. Well, I’d pretty much given up on the idea of writing (even though I’d been a creative writing major in college) because I’d been so discouraged by fancy writing workshops that made me feel my chick lit voice wasn’t good enough. So that summer, I sat down and wrote the book that had been in my heart, mind and soul for years. I sent it off (See Jane Date) and Harlequin launched the Red Dress Ink imprint with it. (P.S. I did do a year of graduate school, but got so lucky with the writing career at that point that I dropped out to become a full time writer. One day, I want to finish and teach high school English.) I wrote six novels for Red Dress Ink, which folded last year, and one YA for Random House, one young adult novel for Random House, and I’m now writing women’s fiction for Simon & Schuster, with two novels in the hopper (another YA and another women’s fiction). The novel I’m writing now, The Love Goddess’s Cooking School will be my tenth. I almost can’t believe it. I’ve had some amazing luck since that fateful call from my colleague. I’ve had a novel turned into a TV movie. I’ve been sent on a book tour of Italy. A segment Oprah’s producers taped of me almost made into onto her show, but I ended up the cutting room floor (even just being interviewed was a highlight). It’s been an amazing journey, but the best part is what I’m doing now: writing a novel, sweating through it, happy one paragraph, tearing my hair out the next. Learning. Believe in yourself. Trust your gut because it knows. This is the best advice I can give. You’ve been at this business for some time. How do you explain your staying power? Any tips for struggling authors? Because I worked as an editor for a publishing house for so long before I became an author, I know that first and foremost, publishing is a business. And yes, I’ll say it: So is writing. I feel bad saying that because writing is so personal, so meaningful, something that comes from the heart, mind, soul, and marrow. But the part about the staying power—I think that comes from looking at writing as a business as much as looking at publishing as a business. As far as what that means, I’d say it’s just an awareness that if you want to sell your book to a publishing house, you must remember at all times that the editor you submit to has to sell your manuscript to her boss, the sales department, and the marketing department. Tips: Be true to yourself, listen to your gut, but be AWARE. What’s going on in the world of publishing right now? What is everyone talking about? What are the big books? Why? Why are the NY Times bestsellers, in trade, mass market paperback and hardcover, on the list? What about those books gripped a zillion people? Why is the Twilight saga so special? And: doing your homework about submission procedures: how do you construct a query letter and a synopsis that will make an agent take note? There are some great books on craft and submission procedures. Study up! Enjoy the entire process. How would you say the industry has changed since you debuted with See Jane Date? For one, the words chick lit are not to be said aloud. Ssshhh. Someone might hear! Someone might think your novel is about a woman figuring out her place in the world! Nooooooo! Okay, can someone tell me why that’s bad? Annoying? Stupid? Shallow? Unworthy? There are light, frothy chick lit novels and there are more complex, deeply thoughtful chick lit novels. There is everything in between. I love chick lit in all its voices and variations. I wrote See Jane Date when I was a single, serial dater in NYC who was working in publishing. I wrote The Secret of Joy as single mother living in Maine. Boy is my life different than it was eight years ago. You can bet my fiction is different. In terms of the industry, it’s changed because there were a gazillion chick lit books being published to meet demand, and then the happy bubble burst. Too much chick lit. Too many pink covers. What was special and unique and “Yes, someone is writing about life and how I feel!” became sort of dime-a-dozeny. So the pink covers went away. The I AM A CHICK LIT BOOK EVEN IF I’M NOT went away, much to many people’s joy. But books about a woman figuring out her life? There will always be a market. How has this impacted your role as a working writer? I think I’m lucky in that my life has naturally evolved right along with the change in the industry. Just when the chick lit market boomed, there I was, living a kind of chick lit life and burning to write that book. When it waned, my own life was in the middle of changing—I was getting married, having a baby. And when it burst, my life started to burst too—divorce, single motherhood. City to . . . Maine. My publisher calls my work contemporary women’s fiction. Perhaps the names, categories, labels will always change along with covers, with the market. But I do believe entertaining novels about the female experience will always be in demand. I love social media! I am an extroverted introvert, and I was made for Facebook and Twitter. Yes, I realize that’s a bit sad. But I love how easily I can connect with readers, writers, book bloggers/reviewers, industry professionals, and, yes, my best friend from third grade. I love that a reader who’s enjoyed my book can follow me on Twitter, which leads me to follow her, which leads me to learn about her life in short little tweetie bursts. That’s an amazing connection. I learn about why someone enjoyed my book by getting those short bursts about her life. And Facebook, with its access to pictures and friend lists and updates and links, etc., really lets you share yourself in a special way with readers. I, for instance, love knowing that Jennifer Weiner likes whoopie pies (a Maine favorite) or who Emily Giffen wants cast in the movie version of her book. Every time Margaret Atwood tweets, I’m in awe. Margaret Atwood! Suddenly there’s access in ways there never was. We’ve talked about three of your upcoming releases. What else can readers expect from you in the near future? Well, in June 2010 comes The Mosts, my second teen novel about a group of misfits who hire Most Popular to help them change their images (guess who changes the most? ), and then in November 2010 my next women’s fiction novel, The Love Goddess’s Cooking School. I have my idea for my next novel and can’t wait to get started on it. It involves a bit of mystery. Thanks, Melissa! I appreciate you taking the time to talk about your latest news and upcoming releases. Be sure to visit your local bookshop to pick up a copy of The Secret of Joy. Or, you can always click here to buy from amazon.com. Thanks for visiting the blog today. I hope you've enjoyed the Q&A with Melissa Senate. The first thing I must mention is that this week’s Q&A will appear on Tuesday, rather than Wednesday, since the new release of our guest – Melissa Senate – debuts on November 17th. Be sure to come back on Tuesday for the full interview with Melissa as she talks about The Secret of Joy. Next, I must extend some congrats. Winter Wheat 2009: The Mid-American Review Festival of Writing was a smash hit with some truly incredible events. The sessions were top-notch, the Student Center venue at Bowling Green State University was perfect, and it was fantastic to meet so many wonderful writers. Thank you for inviting me to be a part of your festival this year! There are two great events I wanted to mention today. This Friday I’ll be reading at The Lawrence Street Gallery in Ferndale MI as part of the Poetic Travelers series hosted by Tonja Bagwell. The event begins at 6:30pm and features two poets: me and Zikla Joseph, author of the Mayapple Press chapbook, Lands I Live In. If you’re in the Ferndale area, come on over for a free night of poetic joy. Also, I am pleased to announce a full-day workshop taking place on Saturday, January 16 on Whidbey Island WA. I’ll be leading the discussion and workshop, “Writing Your Way: Your Path to Publication” for the Whidbey Island Writers Association. This workshop is a fundraiser for WIWA activities so I hope you’ll join in and support this fantastic literary organization if you can. More details are forthcoming and will be posted on my website. I’m keeping it short today as the to-do list is begging for my attention. Remember to come back on Tuesday for the Q&A with Melissa Senate. If you’re at all in the area of Bowling Green State University this weekend, be sure to drop by Winter Wheat 2009: The Mid-American Review Festival of Writing. Throughout the weekend there are sessions, panels, workshops, and readings covering all genres and styles of writing. The best part? Admission is by donation. That’s right; you decide how much you can pay to participate. This is a really great way to make up for all those other festivals and conferences that seem too hefty to afford, so now’s your chance to get in on the action and enjoy some great offerings. I’ll be presenting a session on Canadian literature and leading a workshop during the schedule on Friday. I’ll be discussing culturally significant writers such as Susanne Moodie and Al Purdy and also sharing work from some contemporary award-winners like Sue Sinclair and Anne Michaels. For those interested in expanding their submissions into Canadian territory, I’ll be offering resources and information on leading Canadian journals who regularly publish work from international writers. One of the highlights of this festival includes the wide range of author readings. This year’s featured readers include Pamela Painter, Bruce Cohen, Khaled Mattawa, James Braziel, and Alan Michael Parker. You can read their bios here. You won’t want to miss Saturday’s events. There’s a bookfair boasting a wide variety of publications and it’s a great way to pick up some personally signed copies. That’s great timing with the holidays right around the corner. If you’re in the area or within reasonable driving distance, consider coming to Winter Wheat 2009. It’s guaranteed to be a great weekend of writing activities! View the schedule and find out more about the event here. For today’s Q&A I had the pleasure of interviewing Nanette Rayman Rivera, a poet I met on GoodReads. She is the author of shana linda ~ pretty pretty and Project: Butterflies. Please join me in welcoming Nanette. In shana linda ~ pretty pretty, you tackle tough social subjects such as homelessness and illness. Did you set out to do the collection as such or did the themes come through gradually in individual poems? The themes were not gradual; they are a part of me. My wild and painful experiences made me who I am and I will always view the world the way it views me. I write about what has happened to me, what bothers me, what I hate, what I love and who I love and hate. I wrote and wrote and eventually had a collection. Writing can have a calming effect on me, but sometimes because I have so much to write about, I become overwhelmed and have to stop and do something else for a few hours or a day. What is your process for writing poetry? Do you have any writing habits, good or bad? My process is all over the place, just like my mind – too many thoughts at once, too many memories; I can’t keep them all in my head at the same time. Sometimes my mind feels like it’s shuffling, like you would shuffle cards and new memories come the next day, but because there are so many, the ones from the day before are almost gone. So I have scraps of paper, napkins and notebooks with things written down before they go away. Often a metaphor comes to mind, and I go further with it, even looking up animals, plants, myths, and other information on the web and before I know it, the poem has taken on more layers. I also care a lot about rhythm. My bad writing habits are smoking too much while I write and losing track of time. The cover for shana linda ~ pretty pretty is haunting and abstract. What input were you able to give in the cover design? "Reflection in a Black Pool" is a drawing of a female head grounded in a sculptural bust of black and surrounded by abstract space. I think in images. My images in general mark me as a neo-German expressionist. For this drawing, I thought about the metaphysics of the image, the nature of its reality. Solving the problem of finding the right space for the figure was the next step; that’s where process comes in. The touch of the brush or pen leads me, in an intuitive way, to develop the space, which is nearly always abstract expressionist. In addition to this book, you have a long record of poems published in periodicals. What are some of your favorite journals to read? I love Oranges & Sardines, 13 Myna Birds, Ploughshares, blossombones, ditch, Clementine, Blue Fifth Review, Cortland Review and Superstition Review. I am re-editing my memoir which deals in greater depth with the same subjects. I write about how our ideas of what life is supposed to be is false, that there are people—or maybe it’s just me—who for some unknown reason are “halted” and told to turn back at every attempt to overcome the original blow. I believe my book will shatter assumptions about free will. Or maybe it won't. Maybe someone reading it will write to me one day and tell me the secret of what went wrong. It is a devastating book to write and to edit. I have to keep reliving these things and at this point, I am glad I’m almost finished. How can readers learn more about your work? I have another poetry collection published by Foothills Publishing. To read some of my other work, you can go to my website where I have many of the memoir and poetry pieces listed by journal. More author Q&As are coming up on the schedule, so come back for more behind-the-scenes views and news from today’s poets and prose writers. Friday I’ll be talking about Winter Wheat: The Mid-American Review Festival of Writing, which has a ton of free events and workshops. In the meantime, visit their website here where you can register in advance for the sessions. Thanks for dropping in today. See you Friday…. have you hugged a poet today? Okay, so maybe not literally, but today is just as good a day as any to reach out and show some support for an author you admire. How? How about writing a review of a recent book. You don’t even have to write for a journal or magazine to review a book. You can easily log on to amazon.com, B&N, or Powells. Actually, did you know you can even have a chance to win free books for posting a review on Powells? That’s pretty cool. Plus, you’ll be letting others know why so-and-so’s book is so amazing and you’ll also make that author’s day a little brighter. Not into reviews? That’s okay; you can still ‘hug’ a poet today by going to the local indie bookstore and buying a new book. That’s an easy one. What if you’re strapped for cash? This is the easiest one yet. Read. That’s right. Read. There are plenty of online journals showcasing incredible works online – for free. Have you read the work from Tarpaulin Sky #16 yet? Or the poetry and non-fiction in The Mississippi Review? There’s some great work in there this month and if you click to view the archives, you’ll find lots of poetry awaiting your virtual hugs. Google yourself silly and you’ll find a lot of great journals with free online access to work just waiting to be enjoyed. Why should you bother with any of this, today of all days? Because today is like any other day. There is nothing special about today. Unless you consider that somewhere out there in this vast landscape of earth a poet has just been told her first book is going to be published. Or maybe a poet’s first poem ever is going to appear in a fantastic literary journal. Somewhere out there, a poet has just received her 97th rejection but is still spending her day writing today, because that’s what poets do. In another part of the world, a poet is volunteering today. She’s helping elementary school kids laugh and learn while playing with sounds and words. Another poet is clocking in to her job at the factory. Another is serving you coffee and asking if you need more time with the menu. There’s the poet who is tending to her sick husband, the one cheering up her mother. Then there’s the poet who is writing a letter to her oldest friend, admitting something she should have apologized for years ago but couldn’t find the words… except in poetry. Today is nothing special. Not in the big scheme of things. But any day is a good day to support the arts. Every day means something to someone. And anytime someone buys a new book or reads a literary journal or sends an author an email to say ‘hey, I like what you’re doing,’ is just one more good day in the life of a writer. Writers need people. We may be solitary creatures by trade, but we need community. We need one another. So, have you hugged a poet today? I love writing festivals and conferences. The fall seems to offer such an abundance of bookish events and there are two I wish to highlight today. BookFest Windsor has already begun but there’s still time to get in on the fun. If you’re anywhere near the Windsor ON area, there are tons of authors to hear read, panel sessions to learn from, and books to explore. Friday’s events include a session called “Poetry Twist” with Susan Holbrook (author of Joy Is So Exhausting) and many other fine poets. There’s a great session on Saturday morning called “Publish or Perish” that includes reps from some very fine small presses including Brick Books. There’s also a “behind the scenes in book publishing” session presented by Janet Friskney and Leslie Howsman. Full event details and ticket information is available online at http://www.bookfestwindsor.ca. Next week, November 12-14 Bowling Green State University will host the Winter Wheat 2009 Mid-American Review Festival of Writing. Saturday includes a monstrous book sale, but for those interested in workshopping or learning the latest news and trends in publishing, there are also so many wonderful sessions to chose from. The cool thing? You decide how much you pay for the event. I’m not kidding. Winter Wheat operates on a donation basis, so you decide what you can afford to contribute for attending the festival. That’s pretty incredible, especially in tough economic times. Oh, the other cool thing about Winter Wheat? I’m presenting a session and workshop on Friday afternoon. The session is “Oh, Canada! Writing Without Borders” and includes a discussion of some contemporary Canadian literature, followed by a few writing prompts to tap into your inner Canadian, regardless of where you live. The full schedule of offerings is available here and it is recommended you register in advance. Let me know if you plan on making the trip to Bowling Green OH. Thanks to those who came out to the Poets Follies reading last night. It was a lovely time sharing the mic with author David Matlin. Another MI reading is coming up soon, at Lawrence Street Gallery in Ferndale on Nov 20th, so if you missed last night you have another opportunity coming up soon. Plus, there’s an open mic so please bring along a poem or two to share with the audience. Thanks for dropping by today. Have a great weekend and see you next time. Today I am pleased to share an interview with Magdalena Ball, author of Repulsion Thrust. You can learn more about Maggie here, at her website, but please feel free to leave comments or ask questions after this Q&A. Your latest book, Repulsion Thrust, has such an intriguing title. How was it selected? How is the poetry of Repulsion Thrust different from the poetry in Quark Soup? Quark Soup was a chapbook, which means that it was short and fairly well defined. They were poems that specifically took the human condition and aligned it with physical laws from the macro world of astronomy to the micro world of Quantum Physics. Because Repulsion Thrust is a full length collection, I was able to do more with it - to extend the scope of what I was looking at as a poet. The book is broken up into 3 sections. The first, "Black Dog" is an exploration of darkness: depression, addiction and loss. The second section is an exploration of the environment and moves away from the individual to the world as a whole. The third broadens out further into a lighthearted (I'm not generally lighthearted in my work -- so lighthearted in my own dark, deep way! ), almost Buddhistic expansion away from the first two themes and outward. As with Quark Soup, there is much that has been inspired by and pivots around science, whether it's Darwin's work (I've been very immersed in his books of late), or theories of identity, or techological impacts, or astronomy (never too far from my mind) - I read a lot and widely, and when something gets to me, it will usually inspire a poem. Let's talk about your process. When writing poetry, do you think of how poems will work together for a collection or do you write individual poems and then think about themes and collections later? That's a good question. A little bit of both in this case. At the start the poems were written individually, but when I got to the point when I had decided I'd be pulling together a complete collection, I structured the book before all the poems were written. Then having created that structure, I began to work the poetry around those themes. You've also written a novel, Sleep Before Evening. How do you balance poetry and fiction? What does working on both do you for, as a writer? I find poetry to be a joyous and fully pleasurable activity, so tend to write poetry frequently. Fiction is much harder for me and takes a lot of structural pre-work and much more intensive, long term research to do. So the two activities tend to work very well together. The poetry tends to be more intuitive, more immediate in terms of completion, and more gratifying in the short term, because I can generally send it as I'm pulling the collection together - instant gratification if you like. It gives me an immediate sense of creative fulfillment that helps bolster up the longer term projects. The fiction is a much longer term, more structural creation, and to a certain extent, more left brain for me. So working on both keeps me balanced as a writer. Tell us about The Compulsive Reader and how it came about. I had been writing reviews and doing interviews on a freelance basis for a website that folded, and basically I didn't want the flow of books to end! So I decided to start my own website. At first it was just me doing everything, but little by little others began sending me reviews and the site just grew and grew. I added a newsletter and before I knew it I had loads of subscribers and a worldwide network of book lovers. About 12 years later, I'm still going! What compelled you to write The Art of Assessment? That actually began as a training manual for would be reviewers. I've always been quite particular about wanting the reviews to be a decent piece of writing in themselves - detailed, thorough, and well substantiated - like a NY Review of Books style review that you might read for pleasure as much as for information. I found that the quality of the reviews I received was variable - sometimes looking like a back cover blurb, and sometimes a plot summary that gave little information about style, quality, characterisation, etc. So I wrote The Art of Assessment as a quick overview for reviewers. But like the site itself, the book kept growing and before I knew it, I had a tangible book and an interested publisher. I Google pretty well, but the best place to learn about my work and stay up to date is http://www.magdalenaball.com/. There's a complete book listing (and I'm about to add Repulsion Thrust - it's due for release on the 2nd of December), a newsletter, blog, links to The Compulsive Reader, contact information and so on there. There's lot of giveaway stuff too, like free e-courses, MP3, electronic books and so on. Please do drop by and have a visit and say hello! Thanks for joining us, Magdalena! More author Q&As are in the works, so please check back for more details. Too, this is just a quick reminder that this Thursday Nov 5th I am the featured poet at the Marick Press “Poets Follies” reading event. The readings begin at 6:30 pm and will be held at the Ewald branch of the Grosse Pointe Public Library, on Jefferson in Grosse Pointe MI. Email for more details. I’m pleased to share the link to my review of Jason Guriel’s second book of poems, Pure Product. My review is at Northern Poetry Review, a review site based out of Toronto ON. Editor Alex Boyd recently appointed me Associate Editor, so stay tuned for more poetry reviews to come on NPR. For this Wednesday’s author Q&A, I’ll be chatting with poet Magdalena Ball, author of Repulsion Thrust. This is Ball’s first full-length poetry book and it is scheduled for a December release, but you can learn more about it here on Wednesday. Also coming up in the near future is a Q&A with poet Nanette Rayman and many other great voices. Keep coming back for the Wednesday Q&A series. Too, I’d like to remind those in the Metro Detroit area that this Thursday, November 5th I am a featured poet for the Poets Follies reading series hosted by Marick Press. The event will be at the Ewald Branch of the Grosse Pointe Public Library and it begins at 6:30pm. And, as it is the beginning of November, I must announce the winner of the October book giveaway! Congratulations to Jamie D, one of this blog’s followers. Remember, if you clicked to follow this blog, you were automatically entered into the draw. How about we do this again? That’s right, for the month of November I’ll do another random drawing at the end of the month and one lucky winner from the list of blog followers will receive a signed copy of one of my books. Jamie, be sure to email me to let me know if you’d prefer fiction or poetry! Thanks to all for visiting today. Remember to stop by on Wednesday for my Q&A with poet Magdalena Ball.